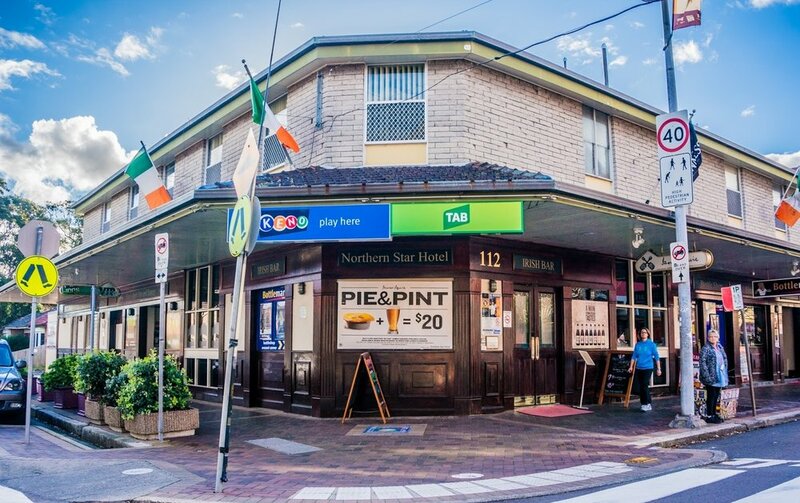 The Northern Star Hotel in Hamilton is owned by the Ramplin family. It has grown from a small one bar hotel to a hotel that prides itself on offering an up-to-date, clean and respectable environment catering for the latest gaming machines, the best entertainment of a culturally diverse range, great friendly bars with a top brasserie/bistro dining. Our restaurant has carved a special place for serving traditional Irish cuisine. The front bar is a great place to relax and have a pint, catch up with a few mates or meet some new ones. You can sample a fine selection of imported and local beers, wines and spirits and check out the many authentic Irish displays on the shelves, walls and in the floor! Every weekend you can enjoy great live entertainment in the cosy front bar. The Northern Star kitchen serves up the very best Irish fare with an extensive menu that would please anyone looking for a taste of Ireland. Try the traditional bangers and mash, featuring Irish sausages served on a bed of mashed potatoes and rich gravy; or the Beef and Guinness Pie, with thick chunks of beef and vegetables, simmered in the rich beer, topped with pastry and served with mash. CHOOSE ANY 2 MEALS FROM THE CHEFS SELECTION MENU AND ONLY PAY FOR ONE! Served with Chips & Salad and Sauce. FINISH IN 20 MINUTES AND GET A NORTHERN STAR T-SHIRT + PHOTO ON THE WALL OF FAME AND YOU CAN KEEP THE BONE! "We have maintained LIVE ORIGINAL MUSIC for the last 22 years at Northern Star Hotel, which we are very proud of. We have supported the likes of Missy Higgins, John Butler Trio, The Whitlams and many other emerging artists in their music by having them play at the hotel back before anyone knew who they were."